Sorry it has been such a long time (again - I seem to start most posts with those words!). Aside from several technical errors (broken laptop, no camera etc), I have barely had time to sit down of an evening recently. Life just seems to be so busy, and that is how I like it most of the time, but occasionally I would like to sit and read in the garden, or just veg out with the girls. It has been chaos and we have had lots to think about and fit in. I have been working pretty much full time at school in both Year 1 and Reception, and have been to Waitrose with them on school trips, done sports day and various other end of term type things, which is all good fun. I have decided though that if I am working properly in September I will get an ironing lady - we nearly suffocated under the pile of ironing that was mounding up in our bedroom it was so huge! We have decided to take the house off the market as now is not a good time to sell (or buy - house prices may keep dropping for quite some time), and we don't think now is the time to be stretching ourselves with a bigger mortgage. I felt really sad about it for a few days, but actually it is the right thing to do, and we do love our house. We have decided to do several of the jobs that we have been meaning to do since we moved in 7 years ago, including maybe a kitchen extension, but also smartening the garden up and various other tasks. The good news is that now we aren't moving I can start going to car boot sales and charity shops again. I have bought some bits and bobs recently (including a bedside table that meant I had to rearrange 4 rooms to get it just right - more on that in my next post! 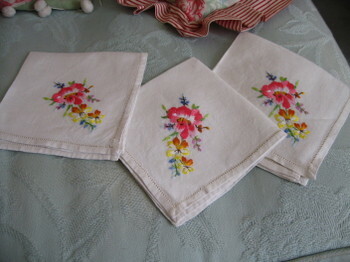 ), and these napkins are my best find for a while. Aside from that, we have had Grace's birthday celebration this weekend - 6 girls to a restaurant for dinner, then back for a sleepover (only 4 of them though, as Ruth and her best friend Ebba went to Ebba's for their sleepover, leaving the big ones to theirs). They went to sleep at about 11.30 and were up at 6 eating Space Dust and giggling. A good time was had by one and all (children, not Bodie, Andy and I! ), and Grace was a happy bunny. Her actual birthday is on Wednesday, and I can't believe she will be 8. She is so grown up and is so lovely to be with, and I can't believe that it is 8 years ago today I was already in labour (it was a very protracted affair!). I don't feel old enough to be the mum of an 8 year old, and I still think of her as my 'little' girl (although she gets her height from my side of the family not Andy's - I'm 6' and he's 5'8"!). I am also quite sad that she didn't want a party this year - sleepovers seem to be the thing once you get older. Still, Ruth's birthday is in 3 weeks time and she is having the real McCoy - pass the parcel, musical bumps - the lot. It may be my last party and I am going to enjoy it (regardless of the fact she would rather be going to the cinema to see Kung Fu Panda!). 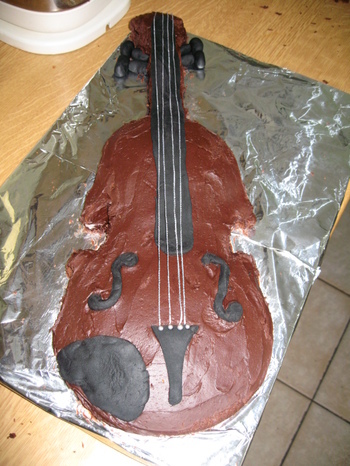 Still, this is the cake for my gorgeous and talented (and now very tired) nearly-8-year-old. She played in the school Summer Concert last week and was the only one from her year in the senior violin group. She did so well and is really coming on, so I thought this would be appropriate (she's also doing well at the piano, but I couldn't make a piano out of chocolate cake!). I had a visit from my best friend from school and her husband last weekend. We haven't seen each other for 5 years, but it was like we had only seen each other a few days before. She met her now-husband when we were still at school and he was at University in Loughborough, and we all used to go out and sit in the Three Nuns pub in our leather jackets and slashed jeans. Much has changed since then, but it did bring back a huge rush of nostalgia seeing her again. We have resolved not to make it another 5 years before we next meet! Our allotment is really coming into its own at the moment. 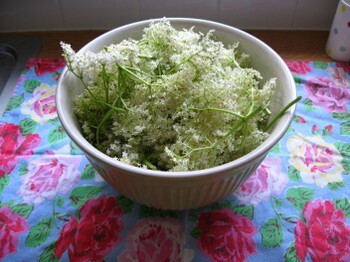 I've made jam and elderflower cordial so far, and am looking forward to making more jams and chutneys as the season progresses. We have been inundated with strawberries and lettuces, and we had our first peas and broad beans yesterday (admittedly only 1 pod of each, but they are coming on). We spent a lovely day yesterday down there with Sophie and Greg. Sophie and I sent Andy and Greg to pick up some lunch from Sainsburys which we had with a huge bowl of salad made from our lettuces, spring onions, rainbow chard and pea shoots. We drank a bottle of cider in the sun and read the paper, while the children all ran off through the wilderness behind our plot, and tended to a Dunnock which had a broken wing feather. It was bliss and just what we needed after the birthday-fest! We then came home and had a roast chicken with a salad made from our own lettuce, baby carrots, baby beetroot, spring onions, potatoes and our own roasted shallots, followed by a huge bowl of strawberries. It did make me feel very virtuous. I also brought home almost the last of the rhubarb to make some rhubarb, orange and ginger jam (I did the first batch a few weeks ago and it was so delicious I felt the need to make more). Unfortunately I was trying to do too many things at once and left the rhubarb to soak up the sugar overnight, forgetting that it was 1 kilo, not 1lb of rhubarb I needed, so I am sending Andy back there tonight for the rest. 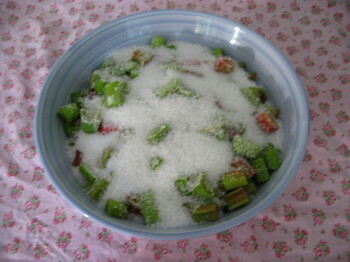 I thought the ratio of sugar to rhubarb looked different to last time! 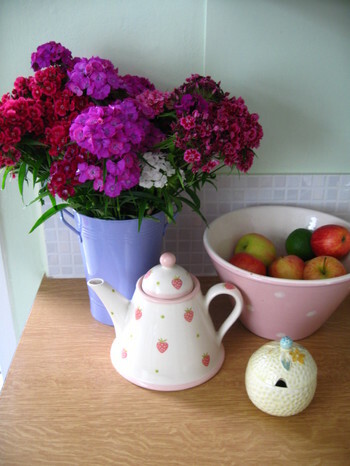 We have Sweet Williams in every room of the house, and I picked the first bunch of Snapdragons from the allotment yesterday. It's not all vegetables! So aside from working at school, birthdays and gardening, not much else has happened. I have my book group tomorrow night, governor meeting on Wednesday and a chinese meal out with staff from school on Friday. Thursday is taken up with 'House' and 'My Name is Earl', so that's this week taken care of! I may need to get the ironing lady to start before September! I think I am missing my camera more than Andy this week! I have done several things that I wanted to share with you, plus scored some great thrift finds, but no images to share, so it won't mean much to you! Unfortunately Andy also broke the cable for my laptop so I can't charge it, and consequently I am sat in the basement instead of in front of Family Guy (my latest 'must view') . He is really blotting his copybook at the moment, but he did say he would get a new one asap, so I suppose I will have to forgive him. I will have the camera back in time for my event of the year which is happening this Sunday - the Stroud Open Studios. I go every year with a good friend of mine, mainly to nosey around other people's houses, but also to get inspiration for being crafty. The year before last we went to an amazing house right in the town centre that I just fell in love with. It was in Country Living last year, but actually the pictures didn't do it justice. It was so beautiful I came away filled with longing to move to Stroud! I did some of the Cheltenham ones last year too, but they weren't as Bohemian as the Stroud ones. So, pics next week for you - hopefully. I have been tagged by Hanne from the lovely Min Verden blog, so I will enthral you all with my answers, which will have to do instead of photos for now. I was on my honeymoon. We took the ferry to Cherbourg and drove down through Brittany, stopping at Barfleur, Vannes, Nantes, and La Rochelle (with a few other places along the way), and then had the second week in a gorgeous stone cottage by the river near Il d'Oleron. We went to Cognac and had a tour of the distilleries (and came back with several bottles), visited Il d'Oleron, St Jean d'Angely (which is the weirdest town I have ever been to - they had piped music playing through tannoys in the streets, but not a soul in sight - creepy), and many other towns and villages. We sat out every night playing cribbage and Scrabble, whilst drinking wine and watching the swallows dart in and out of the barn next door. Bliss. 5 Things on my to do list for today. Well, as it is 9 pm I have done all the things on today's list (yeah, right), so I will list some for tomorrow instead. To be honest, only 1, 3 and 5 are definites (although I may combine 3 and 4). I tend to write lists that would take even supermum a week, let alone a day, to complete, and then feel like a failure by the end of the day when I have only done 1 thing on the list. That isn't a complete list, but they are the more interesting bits. Cleaning the bathroom and doing washing doesn't make for an interesting read!! Anything food related. To narrow it down slightly, i'd have to say any Walker's Sensations crisps, Carrot Cake (with frosting), toasted pumpkin seeds, watermelon, hazlenut yogurt, and obviously any form of chocolate. What would I do if I were a billionaire? I'd buy a Georgian farmhouse with a walled vegetable garden, room for a goat or two (I've always wanted goats), a gypsy caravan for me to go and read in in the orchard, and a beach hut in Lyme Regis. Then I'd make sure my family were comfortable and split the rest between Cystic Fibrosis and MS charities. I wouldn't want to be a billionaire. I would like enough money to be comfortable and to help my family, but I am not very materialistic, and the thought of endless shopping does not fill me with joy. Not a long list here. 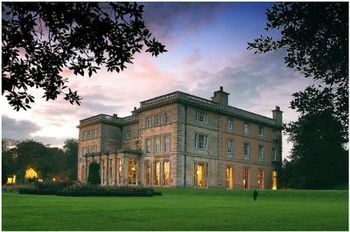 I lived in a small town in Leicestershire for my first 17 years, and then moved to Cheltenham and have been here ever since. I have had 6 different abodes in Cheltenham but only 1 in Leicestershire, and my parents still live in the house we grew up in. Not as exciting as some, but they have all been happy homes. I can't think of anyone who hasn't done this tag, but if you haven't and want to then please do. If you are still reading and haven't dropped off due to boredom (and lack of pics - not that I am bitter) then I'd like to ask you all to name your favourite book of all time (mine is To The Lighthouse by Virginia Woolf). Hope you enjoyed the brief glimpse of sunshine today. ...well, not quite - I still have 2 girls and 2 dogs to keep me company. Andy has gone away with work for the week (taking my our camera with him), so the next couple of posts could be short of a few pics. As to the 2 dogs, we have just taken delivery of the lovely Millie - formerly our dog and now the elderly companion of my parents. We got Millie when we first got married as Andy worked away and I was home alone every week. Unfortunately, being a very bonkers Springer Spaniel (and I know the breed are renowned for it, but she really wins top prize in the mental stakes), I couldn't cope with her plus Grace as a baby, with no husband during the week and a tiny house. My parents very kindly stepped in and took her (and used their own form of dog therapy to reign her in a bit), and she now comes back to us for holidays. We all love her very much (especially Bodie, who thinks his Christmases and Birthdays have all come at once), and she just adds to the general chaos that is our house! Millie was born 10 years and one week ago, the week before we got married. Last Friday was our 10th wedding anniversary, and I can't believe how the time has flown by. We got married in the library here. 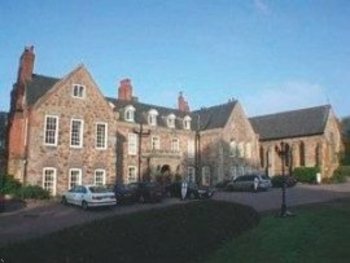 in the Rothley Court Hotel before heading off on a touring holiday through France. It was bliss, and we'd love to recreate it one day (maybe even with the girls!). We don't usually bother with our anniversary, other than to give each other cards, but this year I had a gorgeous bouquet of cream roses (photo on camera in Andy's pocket! ), and as Andy's parents were here for the week they took us out for lunch to a little Cotswold pub, which was lovely. Andy is having a day off when he gets back so we can go out somewhere together (alone!) to celebrate. I know it is a cliche, but he really is my soul mate and we are as happy (if not happier) now as when we first got married. So, moving on from all that romantic mush, does anyone have any good recommendations for beaches to take dogs to? We are going camping several times over the Summer (weather permitting) and this will be our first time with Bodie. Any ideas gratefully received - we don't mind where we go as long as it is somewhere in England or Wales. Scotland a bit far to travel from here with a dog + children + me with my feet on the dashboard, as we always pack more than we need! Well, hope you all enjoy the last day of the hols. Sorry for the lack of home grown pics - I'll make up for it next time!